The very first trailer for Hunter Killer has been released ahead of its October release and it looks like an explosive action-thriller. Gerard Butler leads the cast as Captain Joe Glass, a man on a secret mission who learns about a secret Russian coup that threatens the world order. The film also stars Academy Award winner Gary Oldman, Linda Cardellini, Common, and the late Michael Nyqvist. Hunter Killer is based on the 2012 novel Firing Point by Don Keith & George Wallace. Amid heightened tensions between the U.S. and Russia, a new generation of highly sophisticated nuclear attack subs called hunter killers prowl the murky depths. When the Russian president is captured by his rogue general, an untested American submarine captain (Gerard Butler) teams up with an elite group of Navy SEALs to save him. Now the Americans and Russians must work together to avoid worldwide disaster. 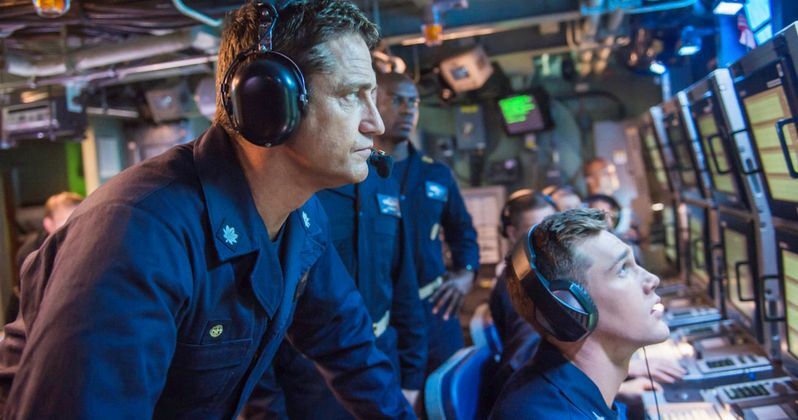 The Hunter Killer trailer makes the film look like an awesome popcorn movie, which would have fit in perfectly with this summer's other blockbusters. Hunter Killer has been in development since Firing Point was released in 2012. Gerard Butler has pretty much been attached the entire time, but there have been a few directors who have come and gone over the years. Antoine Fuqua was the first director attached with Martin Campbell up next in 2015. It wasn't until 2016 that it was announced that Donovan Marsh was the official director of Hunter Killer. Gary Oldman's part as Commander Brad Crawford was originally going to be played by Sam Worthington. Filming on Hunter Killer started over two years ago after it was officially announced back in 2015. In March of 2016 it was revealed that Donovan Marsh would direct the film and Gerard Butler and Gary Oldman would star. The rest of the cast jumped on over the next handful of months after the initial announcement. Hunter Killer is one of Michael Nyqvist's (The Girls with the Dragon Tattoo) final roles. Nyqvist died from lung cancer in June of 2017 at the age of 56. Over two years after filming began, the movie is set to hit theaters on October 26th. Gerard Butler is no stranger to saving a president. Hunter Killer pretty much looks like 2013's Olympus Has Fallen with submarines and instead of the American president, Butler is out to save the Russian president and prevent World War III. With that being said, the movies share some basic similarities, but other than that, it looks like an awesome action-thriller that should be able to do pretty well at the box office upon its release later this year. In addition, this is only the first trailer, so expect to see a lot more about Hunter Killer before it hits theaters. You can watch the explosive and action-packed trailer below, provided by the Lionsgate Movies YouTube channel.